Back in school, my friends Ananda, Carolyn and I used to frequent a small Middle Eastern eatery in a half-empty strip mall in Pomona. Their hummus was divine: it came with either a swirl of paprika-infused olive oil or grilled meat, and a basket of warm pita bread. Sadly, according to Ananda, this dive no longer exists. I was happy to find a local Lebanese restaurant, Dishdash, which makes a similar dish of hummus topped with grilled chicken and pickles. Recently I read an article on hummus by Mercedes of Desert Candy, and I thought, “Finally, someone who vindicates my pickiness about hummus!” I’ve always preferred a smoother, creamier version of the dip served in a broad platter, and it turns out that style is considered more traditional than the chunkier, firmer versions in piles sold in grocery stores (and some attempts at non-Middle Eastern restaurants). Her entry inspired me to whip up this version, a comforting homage to my college days. Hummus topped with sautéed ground chicken, onions, pine nuts and tomatoes (with lavash on the side). Photo by Simon. The hummus recipe I used is pretty similar to Mercedes’, except that I added more garlic (5 cloves) and some extra virgin olive oil (1 to 2 tablespoons) while puréeing the chickpeas. It really does make a difference to remove the skins from the chickpeas. This practice results in an incredibly silky texture. After I soak dried chickpeas overnight, I rub them with a tea towel to remove the skins (thanks to Sonya for this advice!). This should also work for canned chickpeas. Chilling leftovers makes the hummus a bit stiff, but here’s an easy fix: Add a bit of water (or lemon juice) and whisk with a fork, and the dip will become smooth and creamy. If you prefer larger chunks rather than ground chicken, you can follow the recipe for marinated chicken as an alternative. garnishes: ground dried sumac berries, chopped tomatoes, chopped parsley, mint, etc. edible utensils: pita bread, lavash, naan, etc. Stir in the spices: cinnamon, turmeric, coriander, cumin and allspice (and/or cloves). When it becomes fragrant, add the ground chicken. When the chicken is nearly done, but still a bit liquidy, stir in the raisins. When the chicken is done and most of the liquid has evaporated, add the salt, pepper and pine nuts. Set aside. 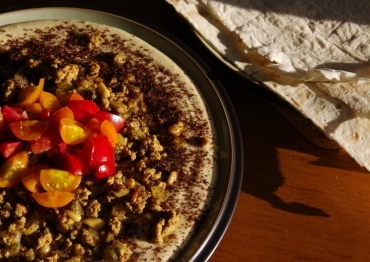 Spread the hummus on a broad platter or shallow bowl. Top with the chicken mixture, then sprinkle the entire dish with sumac berry powder, if desired. Add garnishes and serve with bread. This was written by sairuh. Posted on Thursday, August 2, 2007, at 11:18 am. Filed under Food. Tagged chicken, comfort, dips, spreads, legumes pulses, Middle Eastern, pine nuts, recipe. Bookmark the permalink. Follow comments here with the RSS feed. Post a comment or leave a trackback.